Jaggery is a healthy alternate to sugar as it is unrefined and processed in a natural way without the addition of chemicals. It is mainly prepared by concentrating sugarcane juice, while the other sources are palmyra, date palm and coconut. The sugar made from the sap of the date palm is known as gur, which is more prized. Good quality jaggery has a light colour, good flavour, hardness, crystalline structure and good keeping qualities. 100 grams of jaggery contains 383 calories and when compared to sugar has more minerals especially calcium, phosphorus and iron. It is often considered as a medicinal sugar as it is found useful in common ailments like dry cough and indigestion. Jaggery comes in different sizes or shapes and is used as an ingredient in both sweet and savory dishes. In Mexico and South America, it is known as panela. In Thailand it is used to add the necessary touch of sweetness to hot curries. In India, jaggery has a special appeal in certain preparations like coconut burfi, groundnut toffees, holige etc. It is specially used when it has to act as a binder in the preparation of groundnut and puffed rice balls and other similar products. In western Indian homes, jaggery is added to most cooked dishes consumed on a daily basis. Some people like their tea and coffee to have jaggery rather than sugar! The process of making jaggery which does not involve any chemical agents will have all natural mineral salts retained in it. Cleansing Agent: Jaggery is one of the best natural cleansing agent for our body which effectively cleans the respiratory tracts, food pipe, lungs, stomach and intestines. It helps the body to get away with unwanted particles and thus provides relief from constipation. Better Digestion: Jaggery improves digestion. Jaggery activates the various digestive enzymes and itself gets converted to acetic acid, thus speeding up digestion. Mineral Source: It is considered as a nutrients storehouse. It has minerals like iron, magnesium, phosphorus, potassium, etc. Jaggery is a rich source of many vital minerals that are required by the body for normal growth and functioning. Jaggery is used since many decades as medicine to treat problems such as dry cough, cold and asthma. Jaggery helps in treating conditions like indigestion and constipation. Jaggery helps in promoting relaxation of muscles, nerves and blood vessels, thus enhancing their functions. Jaggery is also a good source of magnesium which is beneficial for the muscles, nerves and blood vessels and may also help relieve fatigue. Jaggery helps to relieve the most uncomfortable and painful headaches, Migranes. Jaggery is a rich source of iron and is therefore, very good for anemic people, as it increases the hemoglobin level in the blood. It helps regulate menstruation cycle in women and is a good source of iron. Jaggery has strong antioxidant properties and protects our body cells from the damage caused by free radicals due to oxidative stress. 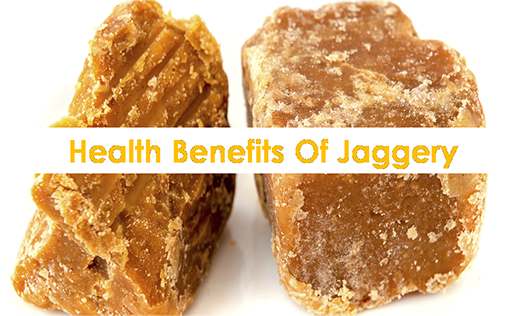 Jaggery has the ability to purify blood and helps in regulating the liver function. A mixture of jaggery and dry ginger powder (suth ) taken with warm water can stop hiccups. Jaggery helps in maintaining blood pressure and also helps the body to flush all the toxins. Jaggery is loaded with many essential nutrients such as vitamins and minerals, that play a key role in many metabolic processes. Jaggery has potassium, helps in reducing bloating and water retention.